If you are looking for social media podcasts then you’re in the right place. 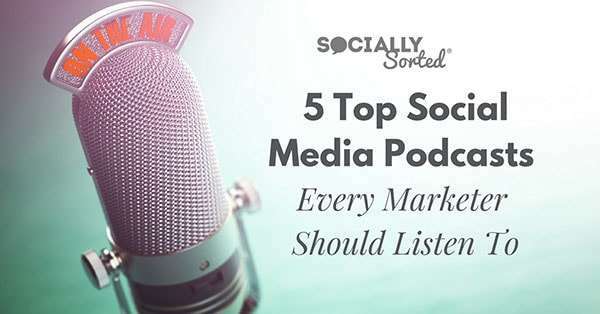 In this post I share 5 of my “top” podcasts to listen to for social media strategy. Each podcast shares practical, actionable tips and tools for getting results with social media for business. Here’s all 5 podcasts (and a handy infographic). In the past couple of years I have fallen in love with podcasts. I can listen to them on the go – walking on the beach, driving, or even swimming laps in the pool. Oh yes, waterproof ipod shuffles are like a piece of magic technology that lets me play music or listen to podcasts underwater! You could say that I am a podcast junkie. I listen to a LOT of podcasts. But life gets busy and we can’t listen to them all. So when I decided to write this post, I figured I would share with you just a select few podcasts, 5 in total. I want to give you the best of the best when it comes to social media podcasts. These 5 are podcasts that I check in to every week. So… check them out and consider subscribing to them all. Seriously. Subscribe. Proven strategies based on real-world experience and data – ie the person sharing the content (be it the host or a guest) has to have actually “done” the things they are talking about. They have to use to tools, get the results, be the crash-test-dummy for the audience. Action steps and challenges for the audience to undertake, in order to get results in their business. An engaging, experienced, authentic host (and a great sense of humour doesn’t hurt). 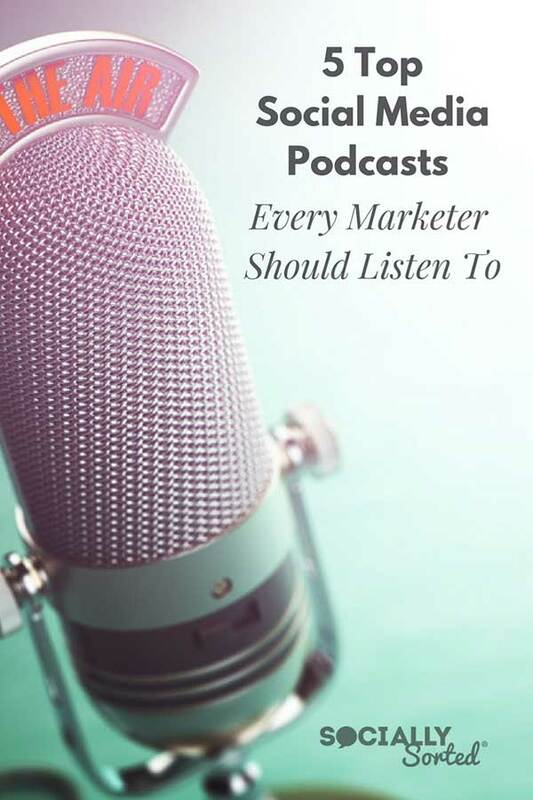 It was #3 that most appeals to me with every one of these podcasts: they all give practical, actionable strategies so you can take their advice and get started. Full disclosure* – I have been a guest on 4 out of 5 of these podcasts (can you guess which ones?). However, I can say that I was an avid listener of each podcast before being asked to be on the show as a guest (and yes, I was very humbled to be asked). 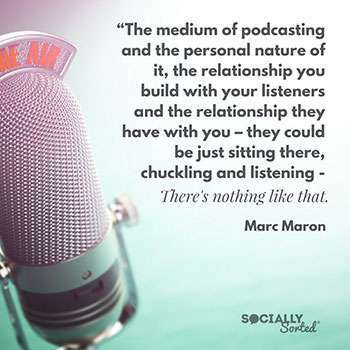 The Social Media Marketing Podcast is probably my go-to podcast for the latest news, tactics and best practice across social media networks. It’s hosted by Mike Stelzner (founder of Social Media Examiner). 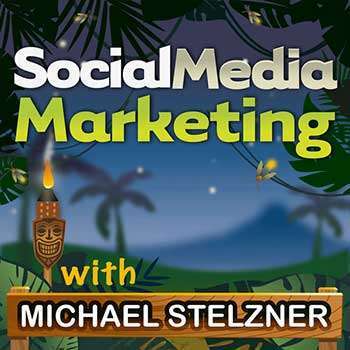 Mike features success stories and expert interviews from leading social media marketing pros. If you only have time for one podcast, this is a front runner! Do a search on “Social Media Marketing Podcast” + the platform or social media topic you need help with. There are plenty of archived shows about just about every social media topic. It’s been going for a few years now, so Mike has a solid library of back episodes to dive into. Find out more here. Listen on iTunes here. 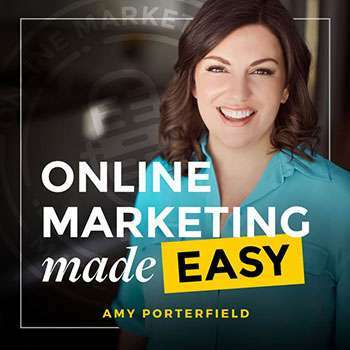 When it comes to practical, actionable (and authentic) advice, you can’t go past Amy Porterfield’s Online Marketing Made Easy Podcast. Amy shares expert interviews, mini-execution plans and the behind-the-scenes secrets of her successful online business. She’s warm, authentic … and genuinely wants to help you get results. Amy’s super-powers may lie in list-building (growing a community), online courses and webinars, but it’s really her willingness to share everything (warts and all) about her wins and losses that will help you to do well in business. She’s also pretty funny, so be sure to subscribe to her podcast, along with all of these shows. Amy provides a useful PDF download or actionable cheat sheet on just about every podcast episode. They help you move the needle in your business using the very strategies she just talked about on the show. Download them. They are awesome. That is all. 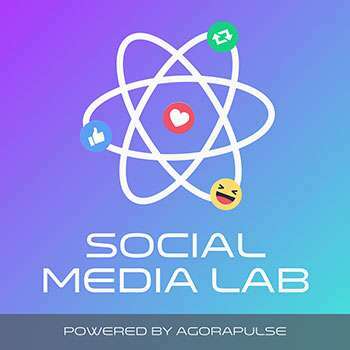 The Social Media Lab is a weekly blog and podcast, co-hosted by Richard Beeson & Scott Ayres and is the brainchild of the team at Agorapulse. Their goal is to “Crack the Code” of social media and then report those results to you so you don’t have to do the dirty work! Lisa Kalner Williams (Content Marketing Director at Agorapulse) also weighs in about the experiments….in a “This American Life radio-doco style” that I love! Put simply, it’s all about bringing the science back into social. Agorapulse are throwing $15k per month behind their experiments in social media with data-driven conclusions on how to increase organic and paid reach. As part of this, Ad expert Jason How will run tests with Facebook ads to make us rethink Facebook advertising! Facebook Live: Is it worth the effort compared to other post types? Do Instagram Carousels increase engagement? Do Instagram hashtags really lead to more engagement. I have been VERY surprised by some of the results. I think you will be too. I like to read the blog posts (which detail the experiment) as well as listen to the podcast. Each episode is only 10-12 minutes on the podcast so they don’t take up much time. The blog post adds visuals and goes deeper into the experiment but both are worth consuming! Want to Listen Later? Pin this to Pinterest! I had to include the Problogger Podcast on this social media podcasts list. I’ve been a big fan of Darren and his content for a while now. He’s the founder of Digital Photography School and the successful blog Problogger (all about how to make money from blogging). The Problogger Podcast is an extension of his Problogger blog and was warmly received the moment he launched it. I’m not surprised – he’s one of the smartest bloggers around! Darren strikes the right mix (just like Amy Porterfield does) between interviews with other bloggers and solo episodes. 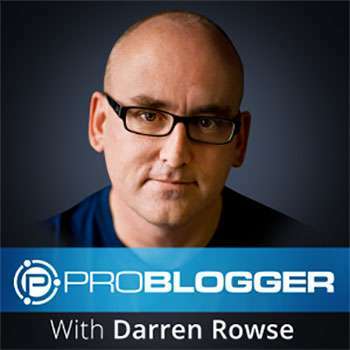 Often Darren will shares what has worked for him with blog monetization over the years. And he shares his failures and lessons too. It’s a great balance. Darren absolutely knows how to break things down into easily actionable steps, which is what makes this podcast so good. Darren occasionally produces a mini-series of episodes within his podcast, so if you stumble across one, be sure to listen to all of the episodes in order. Listen to episodes 112 to 116 for an example of this. He did a whole series about “How to warm up the readers of your blog and turn them into raving fans”. 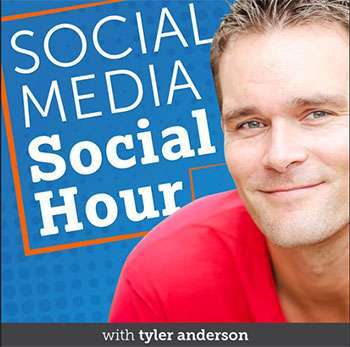 When it comes to Social Media Podcasts, I couldn’t go past this one. The Social Media Social Hour features interviews with top brands, leading marketing professionals and influencers about what’s working (and not working) on social networks. It’s hosted by Tyler Anderson, the founder of Social Media Agency Casual Fridays. Tyler is a great interviewer and I love how he gets brands (big and small) to open up about what’s working for them. I love that some of Tyler’s guests are people you might not hear about on any other social media podcast, so it’s worth adding to your listening list! As with all of these podcasts, be sure to check out the show notes. I love that Tyler summarizes a bunch of quotes from the episodes which provides a quick overview (and give you some fresh content you can create image quotes with if you are so inclinded). Have you listened to these social media podcasts? What are your top podcasts about social media? Leave a comment below and let me know! Want to Listen Later? Pin this to Pinterest. * I’ve been a guest on all of them except Social Media Lab.